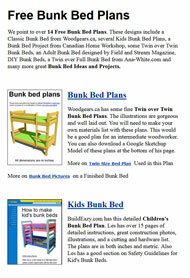 At Free.Woodworking-Plans.org our goal is to point you to Free Woodworking Plans that you can use to build your own woodworking projects. At the moment we point you to over 700 Free Plans. Otherwise just scroll down this page and see what strikes your fancy. Have fun and Happy Woodworking! 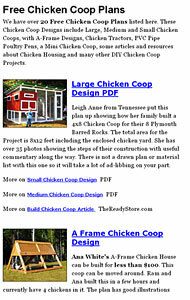 Build a unique Chicken Coop with one of these 20 plans. Also I have some good Chicken House Resources. 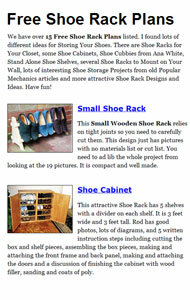 Find a great way to organize your shoes with one of these Shoe Rack Plans. 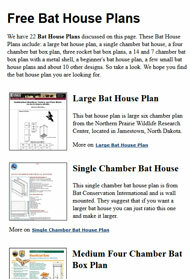 We found over 15 plans to look at. Do you need to free up some space in your home? 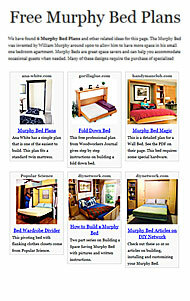 Build a space saving Murphy Bed with one of these plans. 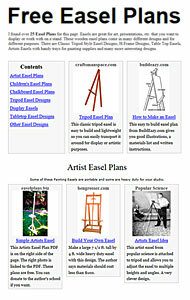 Find a great easel you can build yourself including childrens, display, artists easels and more. 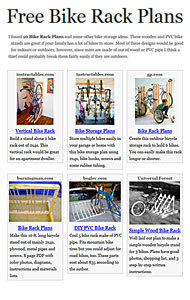 Do you need a Bike Rack to storage your families collection of bikes? Try one of these 10 free plans. 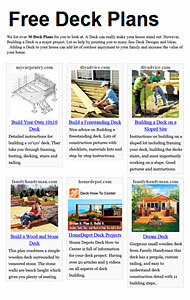 Build a great Deck with one of these 30 deck plans. See the videos from Home Depot and Lowes, too. 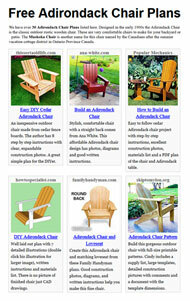 Build this great outdoor chair with over 30 designs to choose from. 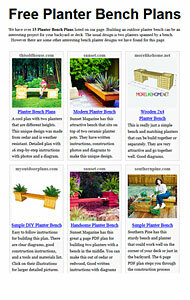 Planter Benches are great for your backyard and patio. 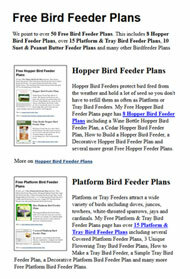 Look at these 15 plans. 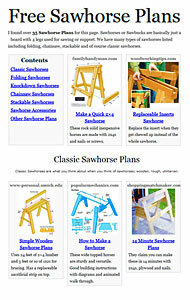 Over 35 Sawhorse Plans with classic, folding, knockdown, stackable and other designs. 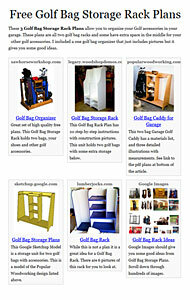 Create a nice hutch to store your Golf Bag and accessories with these Golf Bag Storage Rack Plans. Does your child need a good chair to sit in while eating? 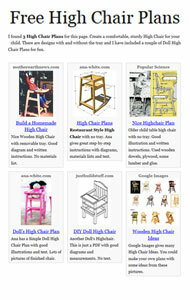 Why not create the perfect High Chair for them. 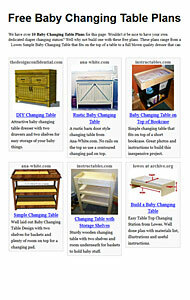 These Baby Changing Table Plans include some simple plans and we include some plans to create an heirloom. 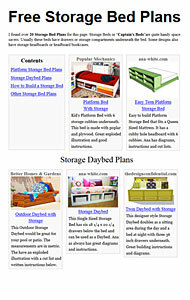 If you need some extra storage in your bedroom why don't you build one of these 20 Storage Beds and save some space. 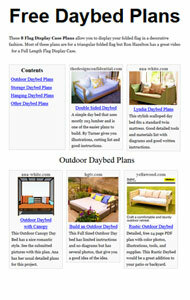 A Daybed can be used as a sofa during the day and for sleeping at night. Another great space saver you can build. 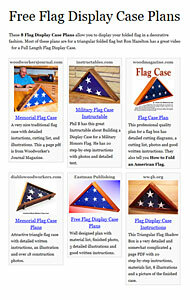 Use one of these plans to display your flag in a decorative manner. There are 8 plans to choose from on this page. 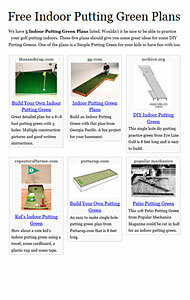 Why not practice your golf put inside by building one of these 5 Indoor Putting Green Plans. 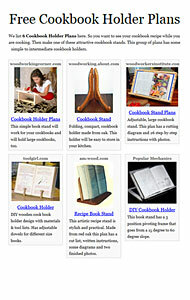 Make one of these 6 attractive wooden Cookbook Holders with one of these free plans. Do you have a large collection of logo golf balls? 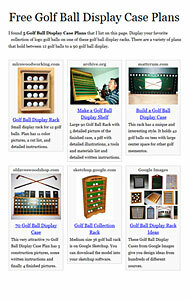 Build a nice Golf Ball Display case and display them all. 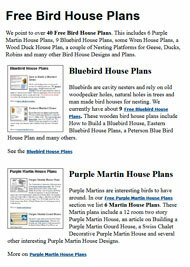 Over 40 plans to choose from you can find the perfect Bird House for your feathered friends. 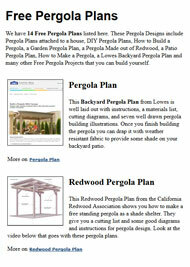 Build your own backyard Pergola with one of these 14 free pergola plans. Don't miss the video. 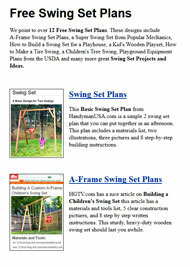 Do you need a swing set for the kids? Look no further. We list 12 interesting plans to choose from. What a fun project for your backyard. 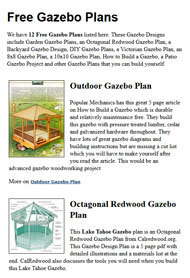 Build a Gazebo with one of these 12 free plans. 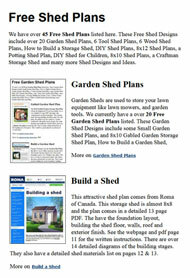 Do you need a shed? 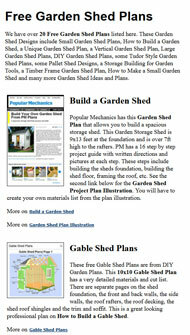 Check out over 45 Shed Plans including Garden Sheds, Tool Sheds, etc. Great space saver, a Bunk Bed can add significant space to your children's small bedroom. With over 20 plans to choose from you can find the perfect Garden Shed for your property. Do you want some privacy in your backyard? 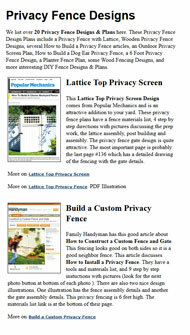 Make a Privacy Fence with one of these 20 plans. Add an interesting Wooden Arbor to your yard. 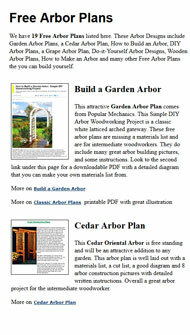 There are 20 Free Arbor Plans on this page. Need to store some wood for this winter. 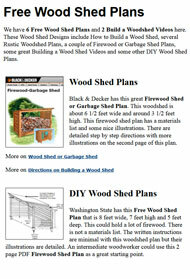 Build a Wood Shed with one of these 6 plans.